There is no fear in love, but perfect love casts out fear. ~ I John 4:18. In J school we were taught not to bury the lead. But this is my blog and I can do what I want to because I am a grownup. I remember a sermon decades ago; the minister was saying that John was the Love Apostle and in his gospel account of Jesus’ life, John was just getting warmed up. The intro in my Bible to I John says his gospel and three books were all written around the same time and that II John was written to a Chosen Lady, who may have been a person or who may have been the Church. Times were tough and there was a lot of double-speak in the fellowship because, well, you could get killed just for knowing who Jesus was. So when in I John 2:10 he says, “Whoever loves his brother lives in the light,” he was probably talking about the disciples, but for me this verse is about the other child of my parents, Bill. He was named for my dad’s dad, William, and for my dad’s favorite ball player, Stan Musial. He showed up in our family a week before Christmas on December 17. His birthday was like the pre-party for Santa. I’m trying to remember if Bill ever had a gift that wasn’t wrapped in red or green. I was not yet 2 when Bill was placed in the car seat (yes, we had them then) next to me in the back of our ’53 Plymouth. I wasn’t sure what he was or why he was there, and I promptly smacked him on the head. What ensued was a lot of yelling and crying from the front seat of the car. I have been viewed with suspicion and alarm by my parents ever since, and rightly so. Bill and I haven’t been a big part of each other’s life for the last 30+ years. We’ve made up for it over the past three weeks, I think. What has been remarkable has been our ability to work in tandem. 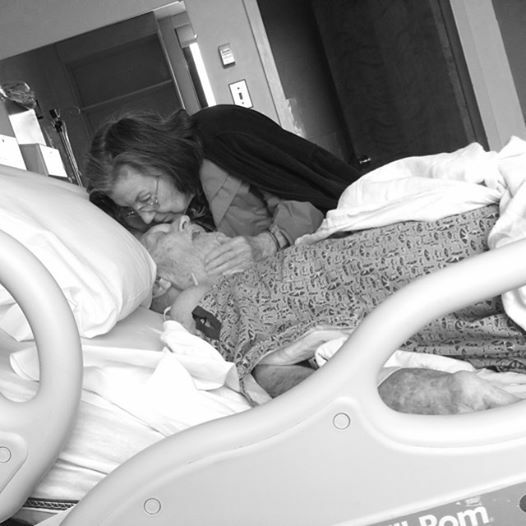 On July 21 and 22 when my dad and mom respectively went to the ER, we chose to trust each other, in spite of what we’d been repeatedly told was the truth about us. For myself, I sent up a short prayer right about then to God, asking Him to please help me to keep my gnarly ego quiet. If I could play nice, that most certainly would attest to the power of prayer. I tell folks (when I can remember to do so) that in every tragedy lies a blessing. We may not see where the blessing falls, but if you’re lucky you can get some on your shoes. So my blessing today is that I know Bill has my back. I hope he knows that I have his. I love him. And I am in the Light. You sleep on the sofa because you put the sheets in the dryer this morning before work. Tonight you’re too tired to put them back on the bed. You go to work with bronchitis because you used all your sick days nursing your kid through his cold. You went to your kid’s soccer game last night instead of going to the grocery store. So you’re drinking your coffee black this morning because you gave the rest of the milk to your kid at breakfast. There’s a 33% chance that you spend more than half of your paycheck on rent. You pay on average a third of your income on child care. In New York, Minnesota and Massachusetts, if your child is 3 or under, it’s more than half. This is because you’re paid less than single dads or married men with the same education. If you were paid fairly, your income would increase by 17 percent and your poverty rate would fall by half. Some folks say, well, you’d be making more money if you’d opted not to have a child. Some of these same folks want to limit your birth control options. It’s tough for you. But your love, unlike money, can buy happiness, and it comes to you through hugs and butterfly kisses and nite-nite prayers.